Okinawa 2006: Stop! Yaeyama Time! One of the most over-used cliches when any event suffers from a downpour is that the rain didn’t dampen the spirits of the people. I thought this to be a load of b*llocks when Ai and I arrived in Ishigaki to see it p*ssing it down but maybe i was ultimately proved wrong on our 5-day Yaeyama Island hopping trip in Okinawa prefecture. DAY 1: We took a 30 minute boat journey to Kuroshima and checked into our accommodation. The weather cleared up a bit before we went snorkelling on the nearby Nakamotokaigan beach and a trip around the visitor centre followed. Having got up at 3.30am following just a couple of hours sleep that was basically it for day one and our short time on Kuroshima. DAY 2: We transferred to Taketomijima which was a lovely, tranquil and traditional island small enough for us to navigate without fuel-powered transport. The roads were mostly just sand covered and along with bicycles the main other form of transportation was via buffalo-drawn cart. We took a short tour of the island and our guide told us that he didn’t control the beasts but that they guided us. My sceptical self didn’t really believe this though. It may have been true to an extent as they know the routes but he still helped it decide which way to turn at times. We were taken around the tiny relaxed village seeing the pretty flowers, coral-built walls and red-tiled roofs with their shisa statues (a kind of lion-dog guardian figure) while also being treated to a song from the guide while playing his sanshin (3 stringed guitar type thing). Before that we went to a few beaches (namely Kondoi Beach, Aiyaru Beach and Kaiji Beach with the latter being famous for its tiny star sand which are actually the remains of sea creatures!) The water was very shallow and a lovely turquoise colour and the beaches were beautiful but the coral was not so good for our snorkelling. DAY 3: Ishigaki again but this time we took a day trip to Kabira Bay as part of a tour. We took a boat out to sea for about 10 minutes and I went snorkelling with a guide while Ai and the rest of the group went diving beneath me. As I have asthma, it’s not such a good idea for me to go diving but I am more than happy to snorkel and here it was very deep and quite strange to snorkel many feet above the divers with their bubbles coming up my way. There wasn’t such a great variety of fish on offer and it was quite cold but I still enjoyed the experience and I also got to wear a proper full-length body-suit for the first time. Back on dry land later I went with Ai who felt the need, like many Japanese do, to buy omiyagi (souvenirs) for about everyone she has ever known! These gifts inevitably included many star-sand related products like key-rings. 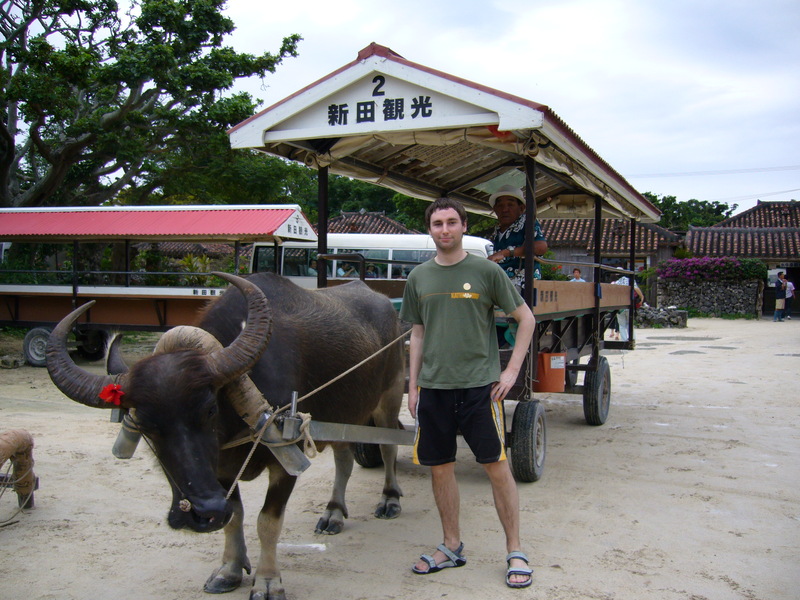 DAY 4: Our penultimate day involved hiring a car back on Ishigaki and then driving around the island. It was a beautiful hot day and the kind of temperature I had been expecting from the outset. We managed to go snorkelling on a quite shallow beach at Yonehara where we saw some poisonous sea-snakes and for the first time ever I actually got bumped by a couple of fish which frightened the life out of me. The one thing I most hate about spending time in the sun is having to apply sunblock as I invariably forget a spot or two and this time was no exception as I went away with a few red blotches in the areas that I didn’t cover. 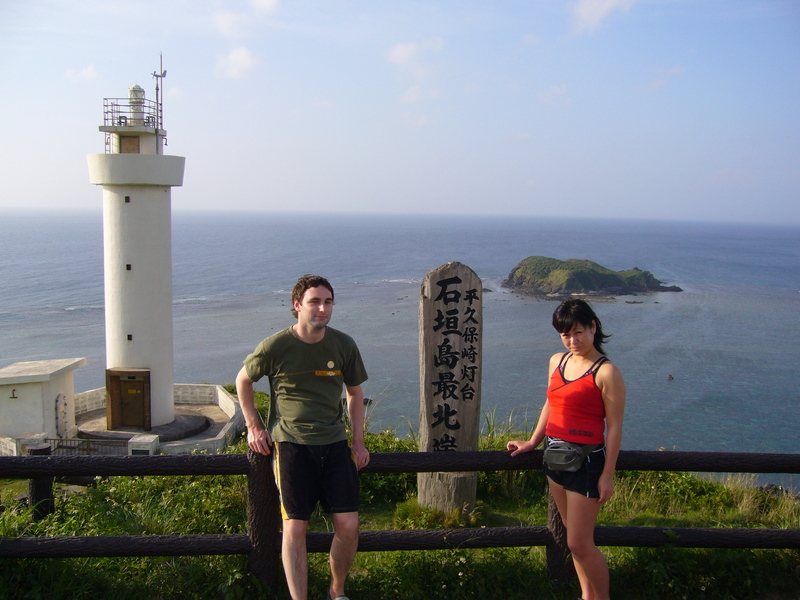 Next on the agenda was a drive up to Hirakubosaki Llighthouse in the most north part of the island followed by Yaeyama Soba for dinner and a very nice sunset at the aptly named Ishigakijima Sunset beach. We then checked into our hotel and went out to a Live House to see some live Okinawan music and more importantly get drunk while also tasting a couple of Okinawan foods. DAY 5: The last day saw a lot of indecision and changable weather as we went from place to place looking for a beach to enjoy our last few hours. We ended up on the east side of the island as the previous days beach was just too windy. Where we ended up was called Inoda auto camp which was an interesting experience. Myself and Ai were the only ones there…..other than 100+ junior high school kids there who were all curious by the presence of a foreigner. This inevitably resulted in me having to endure an unbelievably high amount of simple pleasantries (usually just “hello”) which was usually followed by a fit of giggles. 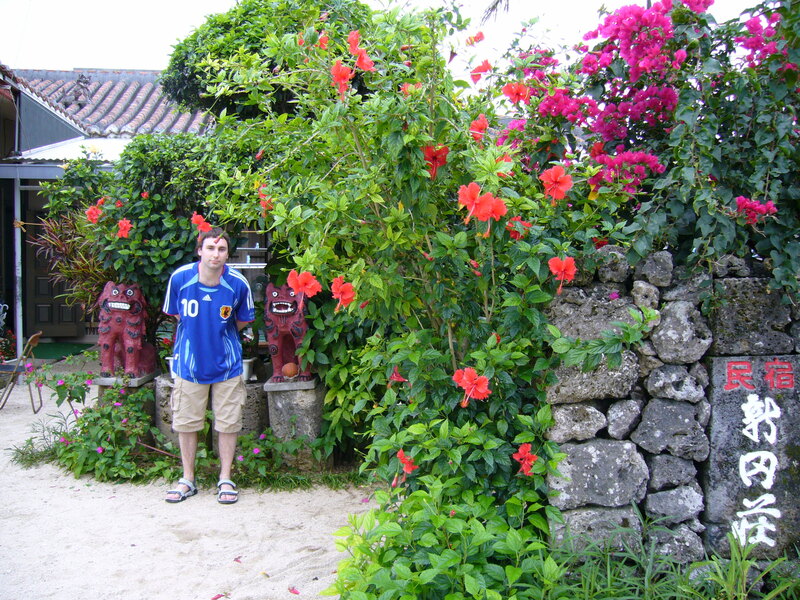 This entry was posted in Asia Travel, Japan Travel and tagged ishigaki jima, kuroshima, okinawa, okinawa karate kid, taketomijima, things to do in okinawa-ken. Bookmark the permalink. 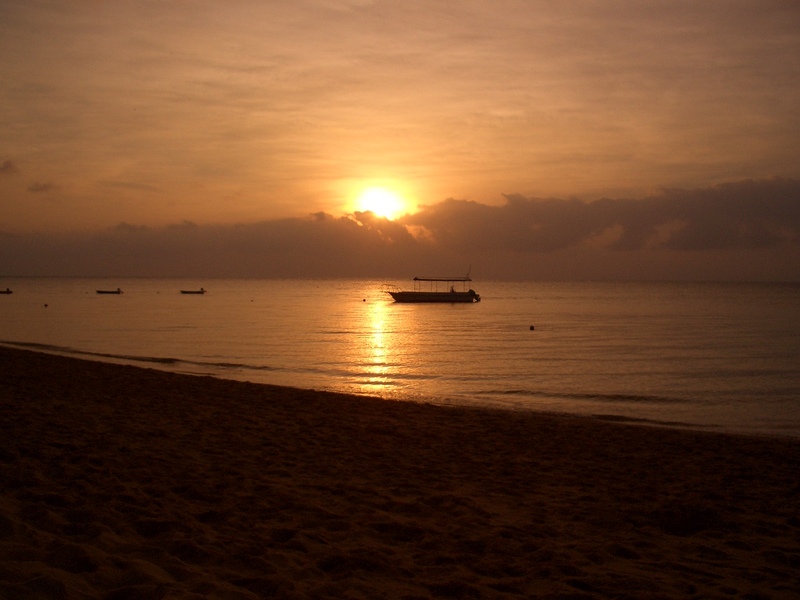 4 Responses to Okinawa 2006: Stop! Yaeyama Time!